MainAll NewsUS & CanadaUS Bureaucracy Keeping Soldier Captive? US Bureaucracy Keeping Soldier Captive? 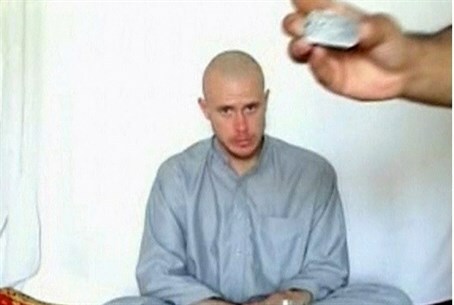 Officials indicate Taliban captors are trying to make a deal to free Sgt. Bergdahl, but that a disorganized US effort has yet to respond. The Taliban terrorists who have held an American soldier in Afghanistan for nearly five years reportedly are willing to discuss his release, but the chances of that happening seem to be slim due to an unlikely source - the American government. Sgt. Bowe Bergdahl, a 28-year-old from Idaho, has been held by Taliban affiliated terrorists since June 2009. He was last seen in a video released by the terrorists last December. According to a defense official and a military officer, who spoke on condition of anonymity, the Taliban captors have expressed interest in proving their intentions to release Bergdahl, but the US has not yet formally responded to the request, reports The World Post. "Elements in all echelons — from the top of the Taliban down to the folks holding Bergdahl — are reaching out to make a deal," noted the officials, while pointing the finger at bureaucratic disorganization for leaving the offer hanging. Efforts to secure Bergdahl's release are marred by an unclear division of authority. An official noted those working on the case include two dozen officials at the State and Defense departments, the military's US Central Command, the Joint Chiefs of Staff, US Special Operations Command, the CIA and the FBI. Rep. Duncan Hunter (R-CA) earlier in the year pressed US Defense Secretary Chuck Hagel to centralize the efforts, noting that centralized command "is little to nonexistent." While Hagel made an appointment to manage the case, that appointment only had jurisdiction over the Pentagon and not the other agencies. Undeterred, Hunter wrote to US President Barack Obama, asking for the Defense Department to be allowed to lead the efforts, and that one coordinator be appointed to manage the case. Such a unified approach apparently has yet to be implemented. Caitlin Hayden, spokesperson for the National Security Council, denied that Bergdahl's continued captivity is a result of bureaucratic incompetency, saying the soldier remains captive because he is held by terrorists, "not because of a lack of effort or coordination by the US government." However, Sen. John McCain (R-AZ) remarked "how can you get him back if you are totally disorganized?" He added that plans to exchange five Taliban detainees for Bergdahl, a plan whose validity he questioned, is "dead" and "hasn't gone anywhere for a couple of years." In neighboring Pakistan, 72-year-old Warren Weinstein was captured by Al Qaeda over two years ago while working as a consultant on US government programs. In a video message last December, Weinstein addressed the US government and said "now when I need my government, it seems that I have been totally abandoned and forgotten." Obama's administration has said it will not negotiate with Al Qaeda for Weinstein's release.